You might not think of it this way, but most of us get scammed — somewhat tricked — out of our hard earned money every single day. These little expenses can add up to big bucks that we could be saving for retirement and spending in our golden years.Whether it’s spending money on dumb stuff, being unaware of hidden expenses, or actually getting scammed by financial services that prey on uneducated consumers, watch out for these 11 ways you might be wasting money that could be saved for retirement. 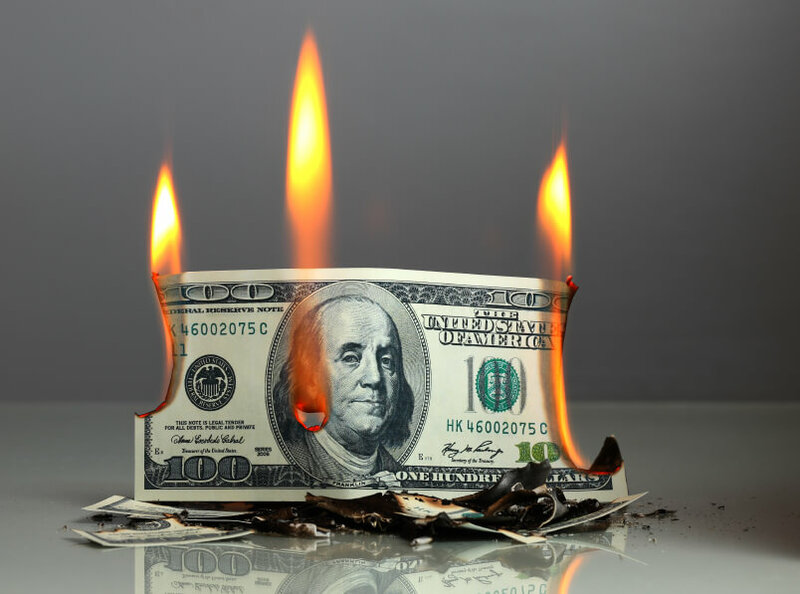 Don’t burn through your money. Save more for retirement. You’ll save more for retirement if you don’t spend your money on these. Monthly memberships and subscriptions — especially those that are automatically deducted from your accounts — can be sneaky hidden costs that you just don’t think about. Do you belong to a gym but never go? Do you subscribe to cable TV but only watch one program in the premium service? Do you get magazines that you don’t read? One study in Britain found that 42 percent of the population spend money on subscriptions that they do not use. It is a good idea to seriously look at your monthly budget and make sure that you really know where your money is going. Assess whether or not you are spending in a way that is necessary or that makes you happy. There are some things you just don’t want to buy used, mattresses, child car seats, and bike helmets being just a few. The one thing you never want to buy new? A car. With auto dealers offering historically low- or no-interest financing on new cars, a shiny new set of wheels might sound awfully tempting, but a new car loses 15 to 25 percent of its value each year for the first five years. What’s worse, with the new wheels comes new expense. A newer car will likely mean higher insurance premiums and higher registration fees. Buying used, on the other hand, is an opportunity to get more for less. Further, you may be surprised to learn that transportation is actually one of the biggest things you’ll spend money on in retirement. So figuring out how to minimize costs is useful. It can be fun to play the lottery. And you can play — just spend $10 instead of hundreds. Stick those hundreds into retirement savings and win the retirement lottery! We’ve all heard the saying, “you’re more likely to be struck by lightning than you are to win the lottery”, yet Americans in the 43 states where lotteries are legal spent $73 billion on lotto games in 2015. That’s $300 per adult in those states, almost as much as the federal government spent on elementary and secondary education for the 2013/2014 school year. Financial guru Dave Ramsey calls lotteries “a tax on the poor and people who can’t do math.” If that sounds harsh, the reality is harsher. A Duke University study from the 1980s found that the poorest third of households buy half of all lotto tickets, in part because lotteries are marketed most aggressively in poor neighborhoods. Want more retirement advice from Dave Ramsey? Find out how much Ramsey thinks you need for a comfortable retirement. A low deductible may sound appealing when you think about a costly claim down the line, but you’ll pay much more in higher premiums. According to the Insurance Information Institute, raising your deductible from $200 to $500 can reduce the cost of your comprehensive and collision coverage by 15 to 30 percent. Worried you won’t be able to come up with the higher deductible in the event of an accident? Put the amount you’re saving in premiums every month into an interest-bearing account and save it for a rainy day. Chances are, the balance in the account will be greater than your deductible long before you’re in an accident. Talk to your insurance agent, maybe you could save $1000 a year. Curtail these habits and save more for retirement. 5. Smoking. Overpriced Coffee. Bottled Water. You might not think of these consumables as scams — but they sure are dumb ways to spend money. Smoking especially. Smoking costs a lot more than the price of a pack of cigarettes. The average cost of a pack of cigarettes in the U.S. is $6.28 but the health-related costs per pack are about $35 according to the American Cancer Society. Over the course of a year, that adds up to over $15,000 for a pack-a-day habit. Think you’re in the clear if you smoke electronic cigarettes? Think again. Although the average cost of e-cigs is less than a pack of cigarettes, the aerosols these products produce contain a variety of chemicals, some known to be toxic or cause cancer. Now that the FDA is going to start regulating e-cigarettes, we can expect more research on their long-term health effects. A bottle of water might cost you $1 or $2 a day and coffee could be as a high as $5 for each cup. If you have any of these vices, cut it out and save more for retirement. 6. Carrying a balance on credit cards. Debt is a shackle that holds you back. Not only does it cost you interest, but it can cost you down the line in the form of a lower credit score, causing you to pay higher interest rates on mortgages and car loans. Your credit score is based, in part, on your utilization rate – how much of your available credit you’re using. Try to keep your total ratio and the ratio for each individual card below 30% at all times. Debt can be an especially bad idea for retirees. If you have debt, you might want to use the NewRetirement retirement calculator. This is a powerful and easy to use tool. You will spend 5 minutes entering detailed but basic information about your finances, then you’ll get in depth analysis and the ability to both enhance your information as well as try out different “what if” scenarios. You will be able to see what happens to your overall retirement financial picture if you pay off your debt. According to Nerd Wallet, the average household is paying a total of $6,658 in interest per year. In some countries, haggling is considered an art form and expected as a part of any transaction. Not so much in the U.S. where the idea of negotiation intimidates most people. We’ve been trained to pay the sticker price without question. Chances are, you could be paying less for almost any product or service. All you have to do is ask. A polite and easy way to ask is, “Is this the best price you can offer me?” You may also be able to get a discount for paying with cash since typical merchant companies charge up to five percent of everything the retailer earns through credit card transactions. You may not always succeed at getting a lower price, but even saving five or 10 percent here and there can really add up to big savings over time. The worse thing that can happen? They say no. Watch out for these hidden costs. Some people will drive out of their way to avoid a $3 ATM fee but they’re losing much more than a few dollars via investment fees. In 2014, the SEC released an Investor Bulletin to educate consumers about how fees can impact the value of a portfolio. Take a $100,000 investment in a portfolio with a 4% annual return and an annual fee of 1% (which is actually less than average). Over a 20 year period, that 1% fee will cost you $28,000. If you were able to invest that $28,000, you would have earned an additional $12,000. What can you do? In some cases, those fees are negotiable. Talk to your financial advisor about how to reduce or eliminate them or use a free service such as FeeX to look for lower cost funds. cost creep – an incremental increase in your bill each month by only a few dollars each month for previously free services. For example, in 2012, Wells Fargo started charging customers in six states $5 for an electronic statement and $7 for a paper statement. zombie charges – fees deducted from your account after you’ve already cancelled your service while the company “processes your request.” When cancelling a service, be clear that you want the charges to end immediately and take note of the date. If you’re still getting billed after that cycle, it’s time to make another call. Don’t fall victim to these scams. It seems like payday loan offers are everywhere these days. When faced with an immediate cash shortage, it could be tempting to take advantage, but this form of short-term borrowing can be very costly. According to a 2012 study by the Pew Research Center, 12 million American adults use payday loans annually. On average, a borrower takes out eight loans of $375 each per year and spends $520 on interest. Although payday loans are presented as an alternative to costly bank overdraft fees, the reality is that most borrowers end up overdrafting anyway, often due to the payday lender making a withdrawal from their account, and most borrowers end up paying fees for both. If you’re worried about overdrafts and have sufficient credit, you’re better off seeking an overdraft line of credit from your bank. While the average 13 percent interest rate is higher than many short-term loan rates, it’s a bargain compared to the over 300 percent APR charged by payday loans. For some people, that federal income tax refund just can’t get there fast enough so tax prep services offer refund anticipation checks (RACS), skimming off hefty fees in the process. In 2013, about 21 million taxpayers took advantage of RACs at a cost of about $630 million. In many cases, the desire to get a refund sooner is being used to get consumers to pay for tax preparation that they could easily get for free via the IRS’s Free File or Volunteer Income Tax Assistance programs. You may end up paying as much as $100 to get cash two to three weeks earlier than you would through typical e-filing of a tax return and direct deposit of your refund. If you’re worried about retirement savings and making any of these wasteful mistakes, reevaluate your spending. Find ways to stop the holes in your budget and start saving more of your extra cash. The sooner you start, the more likely you are to have a comfortable retirement. Most importantly, put together a really good retirement plan. Numerous studies have shown that creating a plan helps you set goals. Setting goals makes you more likely to save and you will feel more confident and happy about your future. The NewRetirement retirement calculator is a good place to start. This tool was recently named a best retirement calculator by the American Association of Individual Investor’s (AAII).